We’re starting to get excited about the World Cup. I know it’s four months away ( I can claim three from tomorrow), but the Winter Olympics is over and it’s the next big thing, unless you could the Giro d’Italia as a big thing, which I suppose I do. Our World Cup excitement has taken the form of playing out all of the games on FIFA 14 on the PlayStation. Yes, it’s nerdy, yes, we’re following the wall chart to have all the games in the right order, and yes, we’ll be following the extra time and penalties rules. I like to drink wine from the countries I’m watching during the World Cup, wherever possible, and so it makes sense to try and do so for our own domestic games. As with any World Cup it’s wise to stock up on German and Argentinian wine ahead of the opening ceremony. 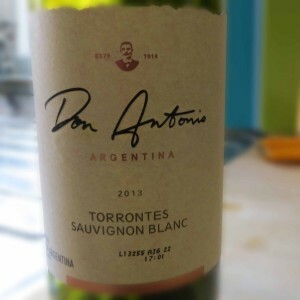 Whilst Malbec may be the wine of choice from Argentina, this Don Antonio Catamarca Torrontes Sauvignon Blanc from Virgin Wines was stocked to give us a white option with Argentinian style. It’s pale and interesting, it smells fresh and fruity, there’s no trace of development, just fresh fruit and blossom. It’s off dry with a mineral acidity. It’s medium-light in body with a medium alcohol level. The Torrontes leads the way with the floral blossom, settling into a lemony flavour that sits well with the Sauvignon Blanc. It’s a good wine, reasonably priced, but I couldn’t help feeling a little disappointed I hadn’t stuck to my Argentinian guns and gone for a pure Torrontes varietal rather than the blend. I’ll be looking out for more Torrontes ahead of June, I suspect I’ll be drinking it until July.